Ketoctin Chapter NSDAR works with history teachers at local middle schools in the Fall semester to conduct the American History Essay contest for 6th, 7th, and 8th graders in Loudoun County Public Schools. Chapter winners present their winning essays at our awards luncheon and receive a certificate and medal. Winners also have the opportunity to advance on to the state, divisional, and national contest. Ketoctin Chapter NSDAR works with history teachers at high schools in Loudoun County in the Fall Semester to conduct the Christopher Columbus Essay Contest. The chapter winner presents their winning essay at our awards luncheon and receives a certificate. Winners also have the opportunity to advance to the state, divisional, and national contest. 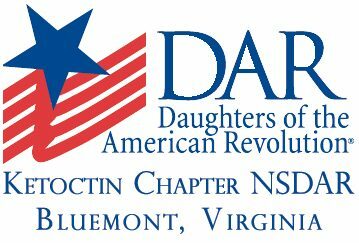 Ketoctin Chapter NSDAR works with five high schools in Loudoun County to recognize and reward students who demonstrate good citizenship qualities of dependability, service, leadership, and patriotism in their homes, schools, and communities. Students are selected by their teachers and peers. Once chosen, the student may choose to participate in the scholarship portion of the program by submitting a personal statement and essay. Ketoctin Chapter NSDAR awards 1st, 2nd, and 3rd place scholarships, and the winners present their essays at our awards luncheon and receive a certificate, medal, and scholarship. Winners also have the opportunity to advance to the state, divisional, and national contest. 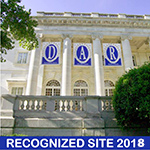 Ketoctin Chapter NSDAR partners with twenty-five elementary schools in Loudoun County to award NSDAR Youth Citizenship Medals each year. Members of the chapter attend the end of year awards ceremony at each school to present the medals to the students. Ketoctin Chapter NSDAR partners with the NJROTC program at Loudoun County High School whose commander names a student cadet of outstanding ability and achievement each year. Juniors and seniors in the program are eligible. The student cadet honored receives the NSDAR ROTC Bronze Medal and Campaign Bar, certificate, and cash award which are presented at our awards luncheon. Ketoctin Chapter NSDAR partners with the Viking Division United States Naval Sea Cadet Corps, USNSCC, program whose commanding officer names a student cadet of outstanding ability and achievement each year. The student cadet honored receives the NSDAR Outstanding Cadet Medal and Campaign Bar, certificate, and cash award which are presented at our awards luncheon.